If you are a parent, teacher, friend, colleague, mentor, or relative of anyone in middle school who shows any interest in space travel, tell them about the Generation Beyond program from Lockheed Martin. There’s also a pair of special initiatives for students. Classrooms will participate in a virtual field trip to Lockheed’s Spacecraft Operations Simulation Center on October 4th . 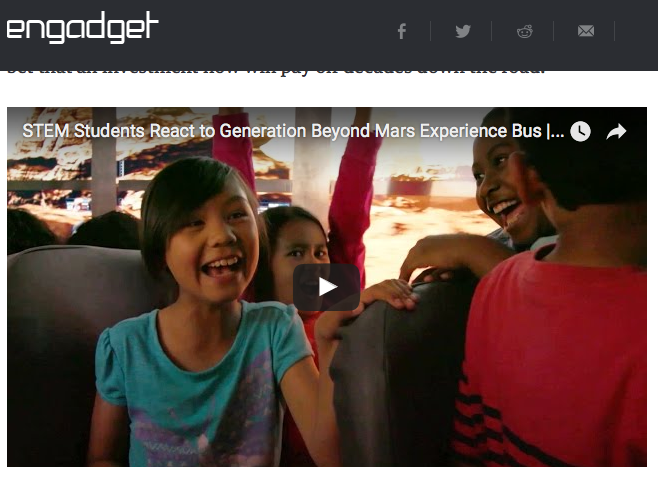 There’s a challenge that will award cash prizes (up to $10,000) for students who produce videos explaining how they would design a Mars habitation module. Potential explorers have until December 15th  to enter. As the article points out, there are many efforts out there to encourage kids in K-12 grades to pursue STEM subjects and projects (science, technology, engineering, and math). We need the help! Many initiatives are tied to the career paths that align with the companies or organizations who sponsor them. I salute and thank Lockheed Martin for taking the long view and putting a lot of resources into their Generation Beyond program. Click that link to go to the company’s website. If you want to look for more programs for your school-aged future space travelers, engineers, and scientists, be sure to do a search of this website! There are other blog posts that will point you to other valuable and fun initiatives that can help someone learn how to be a rocket scientist. If you are going to talk about STEM subjects or teach it in the classroom, why not give it some excitement with space travel?? Not only will it make the journey more enjoyable for you and the students today, it will help the generations beyond too. Thanks for reading this article. If you think it’s worth sharing I’ll be grateful for you to use one of the social media buttons on this page. There are some middle school students out there that will help us travel beyond planet Earth in the years ahead! P.S. To get my favorite collection of resources that have helped me enjoy over 25+ years in the aerospace and aviation community, get a copy of How To Be a Rocket Scientist as an ebook or paperback. You can see the list of all 10 chapters and pick one to get for free here.